What are the ingredients of a sure-shot disaster? Corn on the cob on a functional drill, a human dumb enough to take it on as a 'challenge', and Murphy's Law. The 'challenge' here is to eat the cob as quickly as you can while it rotates on the drill. Once you're done, you challenge someone else. And whoever manages to eat the cob in the least amount of time wins the trophy for idiot of the year. If you've been unlucky enough to spot a video of the said challenge online, you must have asked yourself WHY this hellish 'challenge' is even a trend. Why would anyone want to eat corn like a mutant with average intelligence and terrible etiquette? The videos that have surfaced on the world wide web are a teeny bit hilarious in a painful sort of way. Not only are you wasting perfectly good food, with your butter/sauce lathered corn cobs, but you are also lowering the collective IQ of the internet. Do you enjoy watching messy eaters? 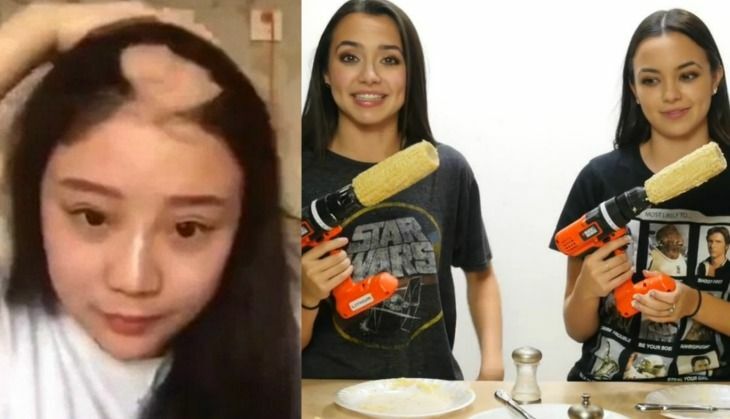 Do you like watching people getting a huge chunk of their hair ripped out? Do you like watching videos that are cute in an omg-that-is-so-idiotic sort of way? Then brace yourselves, we have plenty of entertainment stocked up for you.